If you’re one of those people who literally fall asleep as soon as your head hits the pillow, well, I don’t like you very much right now. I have my good and bad sleeping days, and at one time, the good outnumbered the bad. So, I’d be able to just relax, read a book and fall asleep pretty soundly till the alarm goes off in the morning. But recently, insomnia hit me hard. Eye bags and shadows have taken permanent residence under my eyes and they aren’t even bags anymore, I always say they’re now LV trunks. I’d go to bed but wake up sporadically in the middle of the night and fail to fall asleep thereafter. So I decided to try some sleep aids. A friend had gifted me a sample kit of a Deep Sleep Pillow Spray by This Works but that finished quite quickly, before I had a chance to evaluate if it was working. So, I’ve ordered a full sized bottle and will be putting it through its paces once it arrives. However, in the interim, and in desperate need for sleep intervention, I decided to try a pillow spray from The Body Shop after seeing it appear on Instagram (I love IG but it makes me want so many things! 😛 ) So, once I read that it helped, I popped out to the closest Body Shop store to pick up the Quiet Night Dreamy Pillow & Body Mist. Incidentally, I have noticed that overseas, this is known as Deep Sleep Dreamy Pillow & Body Mist. Same thing, different name. Not sure why. Quiet Night Dreamy Pillow & Body Mist is a bottle filled with aromatherapy essential oils blended with the sole purpose of calming and relaxing your senses to help you fall asleep better. I’ve been using this for a little over a week now, and I must say that it does seem to help me. My problem is not with falling asleep, but with staying asleep. So, before bed, I’d shake up the bottle and spray this mist on my pillow and duvet cover and a light mist over myself. If you get the full whiff of the scent full on, it smells quite sharp and citrusy which initially puzzled me, because citrus smells usually uplift instead of calm. But this being a mist, the scent dissipates quite quickly, and there is a gentle, slightly bitter orange scent left behind. The Body Shop says that the key ingredients are jujube date extract and camomile oil, both of which promote rest and sleep and the product is supposed to be encapsulated in some way so the scents are released through the night as you turn in your sleep, so it lasts through the night. For myself, I did find that using this spray helped me sleep better. I don’t feel the initial effects because I usually spray it on and then read myself to sleep and by that time, I don’t really smell the spray anymore. However, what I realised was that when I do wake up in the middle of the night, instead of sitting up, senses heightened and eyes wide like an owl, I’d be able to relax and drift off again. I’d occasionally catch a whiff of scent of this spray, but it isn’t obvious. It isn’t very strong and I do find that I do have to be quite generous with the product. It doesn’t stain my sheets, but if you spray too close, it can mark your sheets so I’d advise caution and spray from a foot or so away, so the mist spreads over a wider area and not concentrate on one spot. Thus far, it works for me to relax my senses and anything that helps me sleep and stay asleep is a boon! 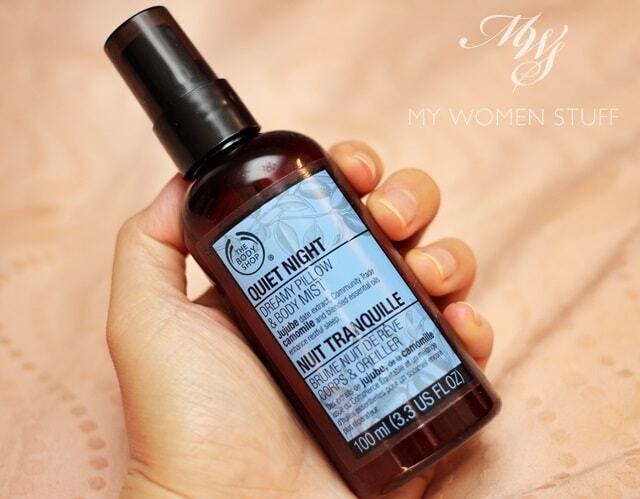 The Body Shop Quiet Night Dreamy Pillow & Body Mist is an aromatherapy mist that you spray on your pillow and sheets or even over yourself before bed, to help relax and promote sleep. I find that the citrus scent is a rather strange scent to find in a product that promotes relaxation but it seems to work. I do find the scent relaxing and it helps me stay asleep longer or to sleep through the night which is my primary problem. I do find I have to be fairly generous with its use but thus far, it seems to be working well for me. Have you used this pillow mist before? Do you have recommendations for other pillow mists to help promote sleep? Yes, I was concerned it wouldn’t help so thankfully it did! I’m still getting up at night but at least am going back to sleep so it’s not as bad. I used to sleep like a log and now I barely sleep tsk! I have a “windy” stomach , and it wakes me up in the middle of night too. My cure is a cup of hot water, take a few minutes walk (in the dark!) to calm down, then off to bed again to drift off to sleep. It doesn’t help me to sleep at all. Works like a charm for my bf though. Other than smelling pleasant, it doesn’t work for me. A pass for me. I don’t have problem with sleeping but I always have action-pack dreams so perhaps this might help me to get more relax and dreamless state? Maybe I spray the general area of my bed instead of direct to my pillow as you said might stain if too close. I have the same problem. If I wake up, I’m up. I haven’t really found anything that helps, but I find if I talk a walk in the evening and then a hot shower, drink some chamomile tea, I tend to sleep through a bit longer. I did go to the doctor and he gave me some pills, but i’ve been too scared to try them! Pills scare me! I tried to tire myself out but even after exercise I still wouldn’t sleep through the night. Now I do, with a little bit of aromatherapy help so I’ve learned to put a little faith in these essential oils 🙂 I’m going to try tea soon. I’m told Sleepytime tea is quite good. Have you tried yoga deep breathing exercises? I was told that it would help with sleep i.e. better sleep. One trick I learnt was if I force myself to sleep, I will stay awake but if I try to stay awake, I will nod off to sleep. Reverse psychology works for me I guess. Also, I try not to look at the clock because it frustrates me when time passes and I can’t sleep. I’m not minded to spray stuff on my pillow, but I would use an aromatherapy diffuser. Ooh L’Occitane have something similar? I”ll check it out, thanks Sunny! I recently picked up a bottle of lavender oil so I’ve been dripping it onto a piece of tissue as well and I think the whole combination seems to be working! They got a bunch of other products besides these sweets, can try! Hi Anne, oh dear you have? That’s awful! 🙁 I’m actually scared of sleeping pills to be honest. I once tried one in Uni (a herbal one) and it kept me feeling like a zombie for days! I’ve never dared take another pill since. We don’t have Lemongrass House here but I’ll be sure to keep it in mind for the next time I’m in Singapore. Like you, I find that these, while not a cure, help relax the senses and then, it becomes easier to sleep and to sleep better too. I’ve tried the This Works Deep Sleep Pillow Spray too and several pillow sprays but find none that is lasting. I prefer to use essential oil balm etc to rub on my forehead to relax and induce better sleep. Which essential oil balm do you use, Lisa? I tried the Badger Balm one which doesn’t seem to work anymore or rather doesn’t smell of anything anymore. I found it quite helpful when it was new. Do you dream anything interesting when you sleep after using this Paris? I think the scent of lavender oil, or the fragrance itself is quite soothing but not sure about if it will help to better the sleeping pattern :D.
This does not work much for me as well but since I still have this bottle, I may as well finish it somehow. LOL. I still have to find other methods to fall asleep because I do get insomnia once in awhile. One way for me is not to read too much at night or watch TV shows or movies that would leave me thinking too much. LOL. Light reading is still fine but no FB at night because some of the posts makes me think too much. Hahaha.